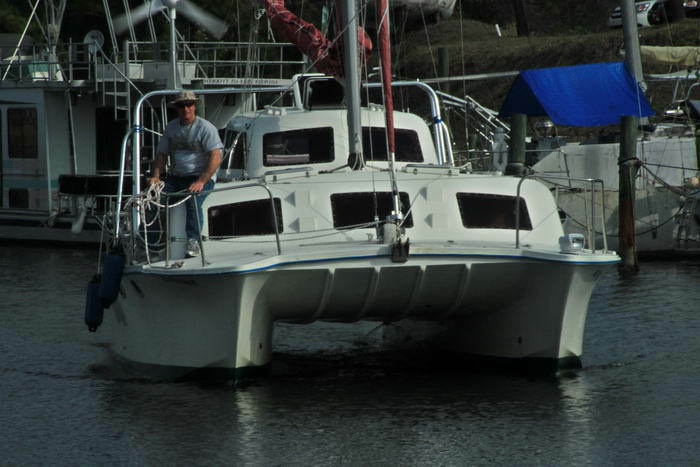 Andra and Tom Gaskell, who reside in New Smyrna Beach Florida, are the proud new owners of the 9m Catalac - S/V Camelot. They plan on enjoying boating in all of Florida, as well as the Bahamas. We do need to do a bit of work to get her ready. 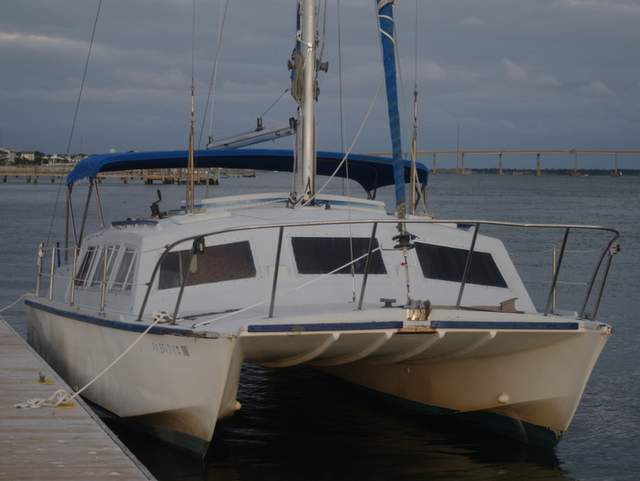 She did suffer some hurricane damage with sail rigging and needs the normal engine work after not being used for 7 months. But we did motor her home from Green Cove Springs Marina to New Smyrna Beach via St Johns river and ICW after some rewiring of corroded electrical plug and a new port engine starter. Now the fun begins to see what the sails all look like and repairing the Jib!! 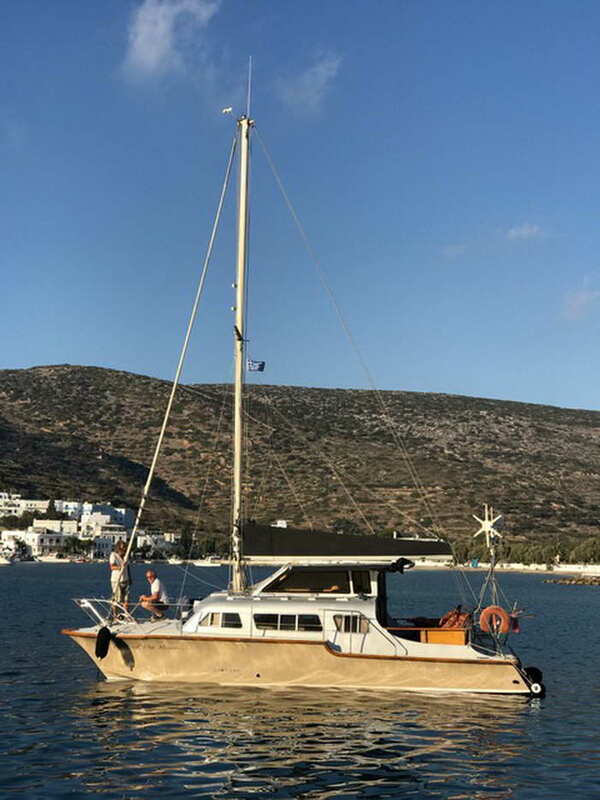 Martin Connelly bought a Catalac 9M, formerly known as S/V Su-Su - sail no 251, and now known as S/V "Back of the Moon", three years ago in Leros Greece. He had no previous sailing experience but he is a quick learner. A retired designer, I set about making her a permanent home. I removed the helm cover and cut out the sliding hatch to enlarge and make full head room in the saloon and enclosed the helm station. The restoration is complete both internally and externally and I’m considering selling and looking for a 10m to restore. 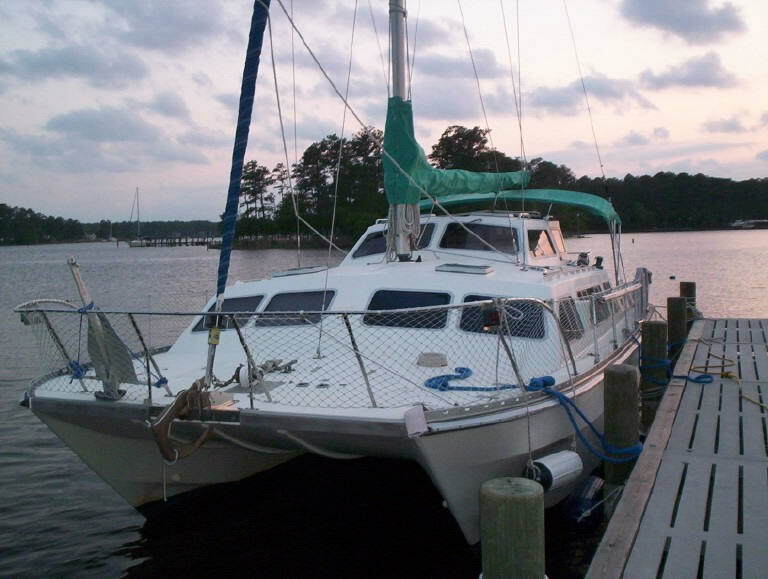 Ray and Lori Braun bought S/V WindSong, their 1985 Catalac 9M in 2010 after using our website for their research. They are now enjoying life on the Rio Dulce, Guatemala, learning how to be snowbirds from Canada. 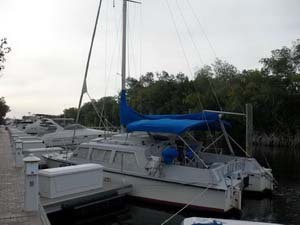 Retired, and living with \leukemia and arthritis leads me to appreciate the space, comfort, and great sailing on our 9M. A modification we enjoy is our hard bemini!! 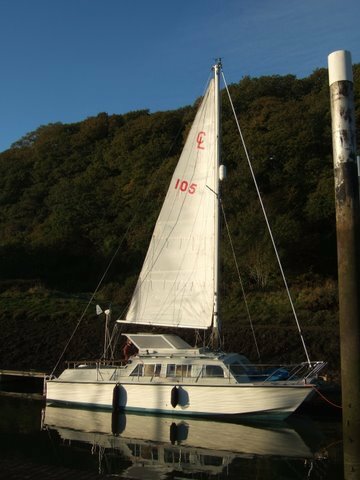 Ben Stone purchased Lygica sail no 128 in August 2015 and sailed her from Southampton to Milford Haven, a 300 mile trip. 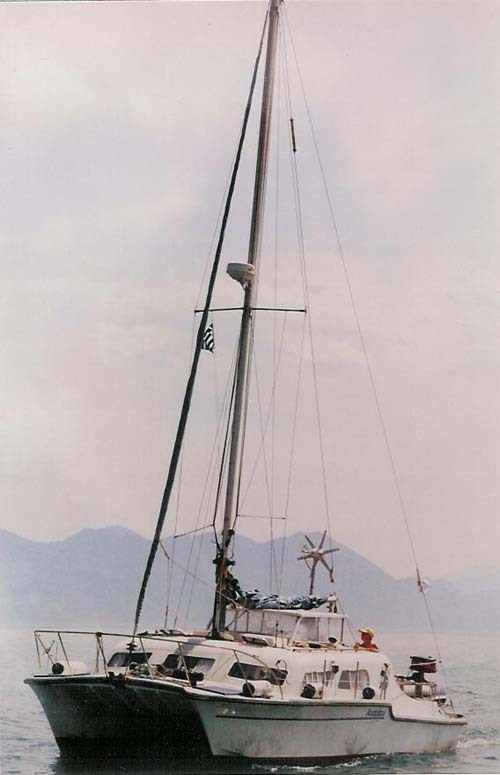 S/V Lygica is a 1981 Catalac 8M and possibly one of the last to have the old style kick up rudders (unfortunately). 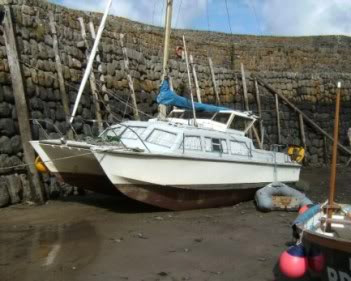 Ben says that he has alot of history with the boat and knows she was purchased as part built boat. The main draw to the Catalac was the fact he is just starting a family and the stability is a massive plus also his father who owns a summer twins 25, gave him a lot of encouragement to switch from mono to a cat. 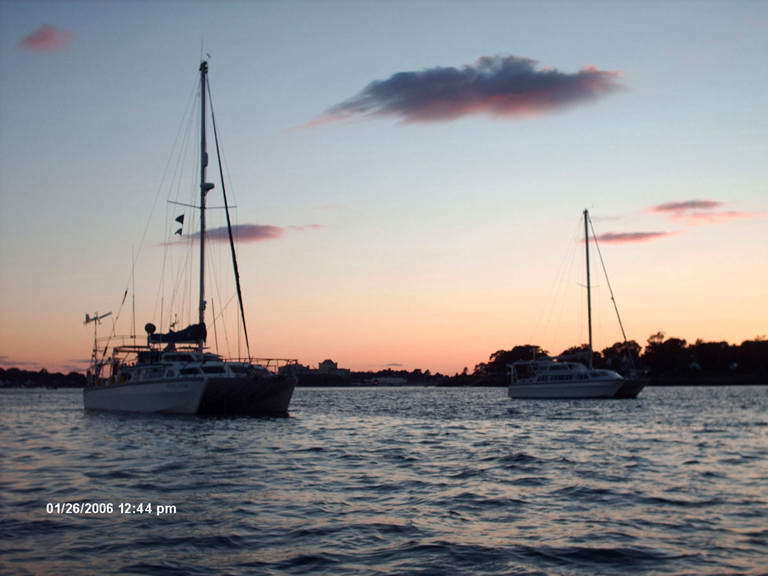 Jim McKeever informed us that S/V Meltemia sank at her dock in July 2014. However, her future is no longer in doubt. Keith Dennis is the new owner and advised us that the port Yanmar diesel has been revived enough so she will be able to be moved to the yard soon (2015) for new bottom paint and to take care of the through hull that corroded out which caused her sinking. She will now be refurbished by her new owner. 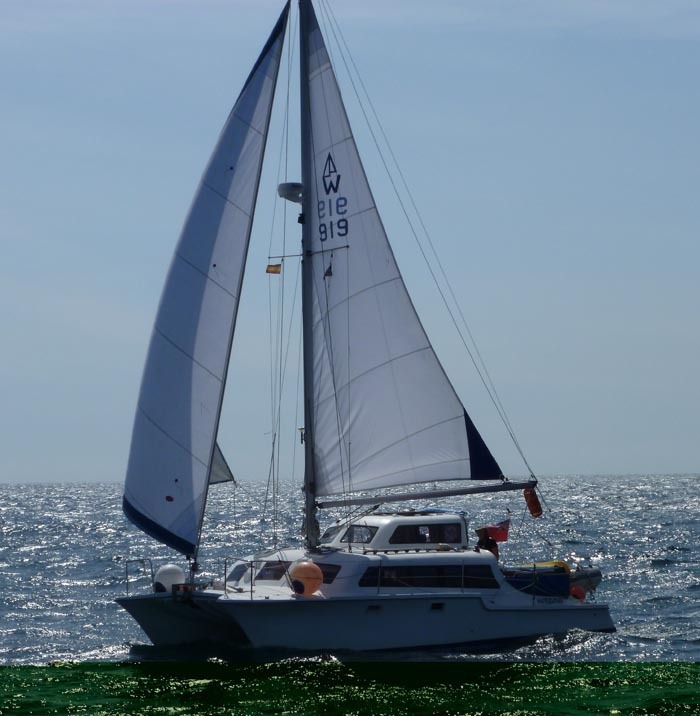 Sven and Sabine Seren crossed the Atlantic in 2014 on their Catalac 10M, S/V Blue Felix. They departed the Cape Verde Islands in May and arriving in Suriname South America 14 days later. They averaged 5.7 knots over the passage. Not exactly a racing machine, but a solid and stable performer. Other than a small glitch with their auto pilot, quickly resloved, the crossing was flawless, and the boat performed well. 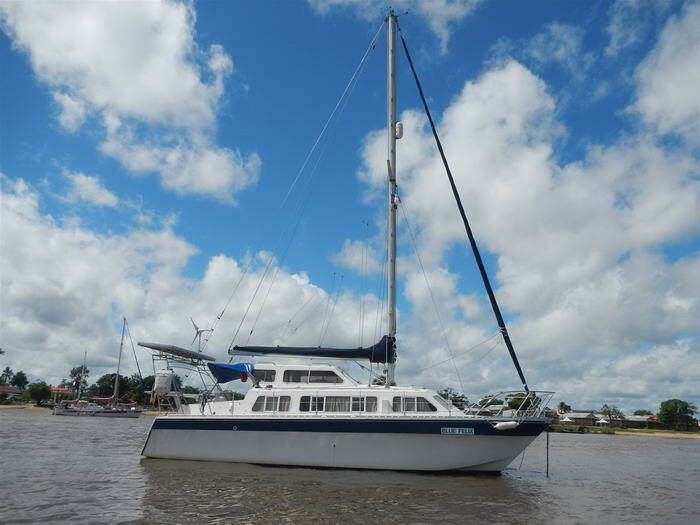 After 6000 miles, and over one year living aboard including an Atlantic crossing both agree that this vessel fits them very well and they would buy a Catalac 10M again at anytime. 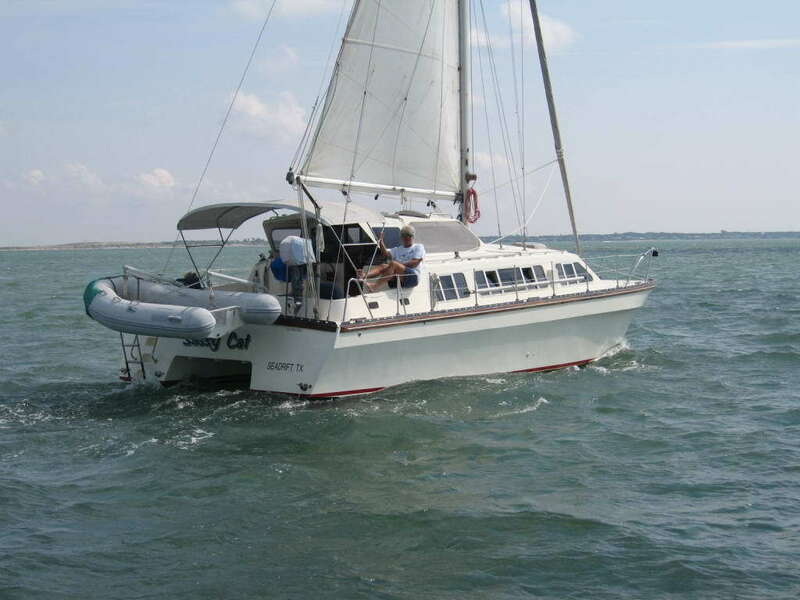 Peter Fehringer is the Proud owner of the Catalac 9M S/V Squib. 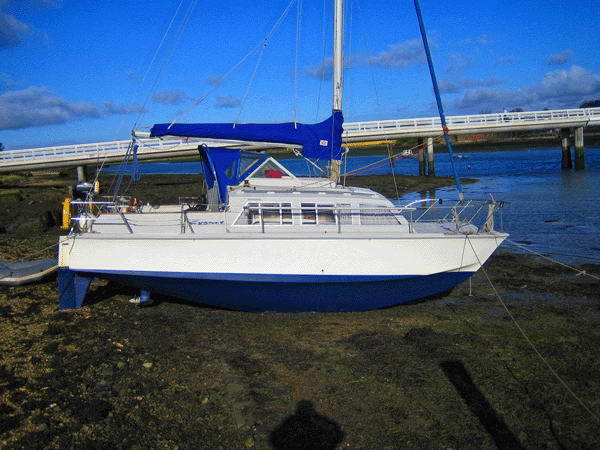 He and his wife are very experienced sailors, having owned a 30 foot monohull which they sailed all over. First through the North Sea to the Netherlands and the French Channels to the Mediterranean Sea. Then on to through Corsica and Italy to Greece. In 2004 -2009 they sailed through the Greek Islands and from 5/2009 to 10/2010 they completed the Atlantic Circle. (that's two trips across!!). 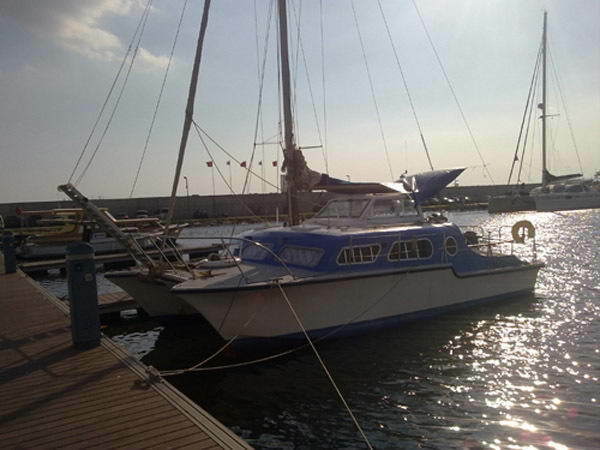 In April 2014 they bought S/V Squib. 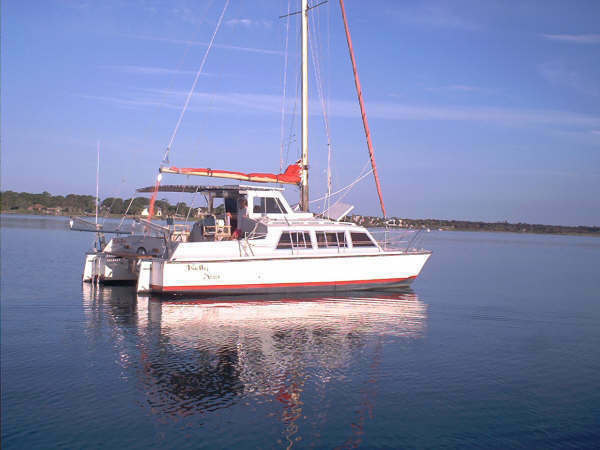 By the end of May they took their first holiday on their new catamaran and have been happy with the decision to select a Catalac, much more space, no heeling and a little bit faster then their last boat. 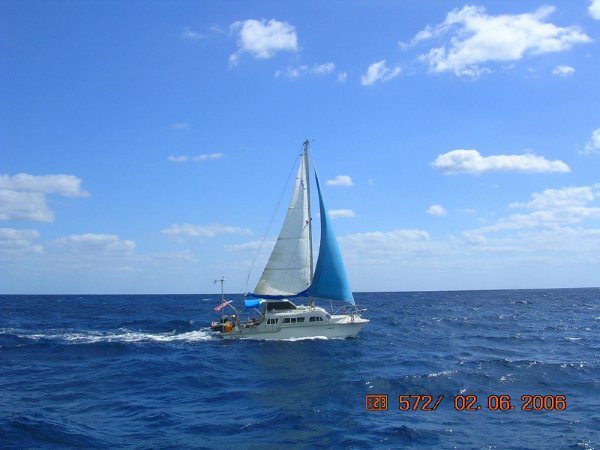 Meet the S/V Cats Away, the only Catalac 8M we know of that's inroute for Australia. Owned by Zlatko and Lorianne Saravanja and currently in Virginia, USA, they are heading south for the Caribbean in spring 2014 and then west for the Panama Canal. 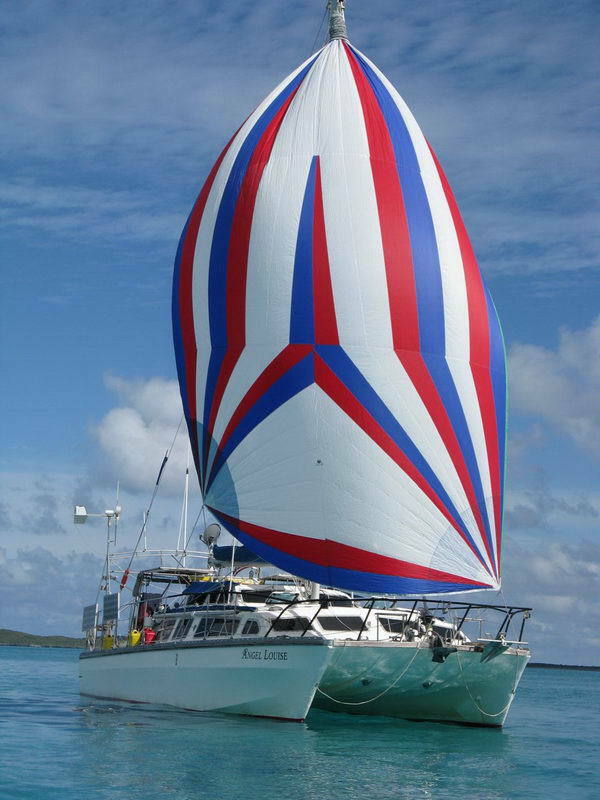 Jeff & Diane Curran have the distinction of being the first to sail a Catalac 900 across the Atlantic. Currently on the Island of Grenada in the Caribbean, they have years of island hopping in tropical breezes in their future. 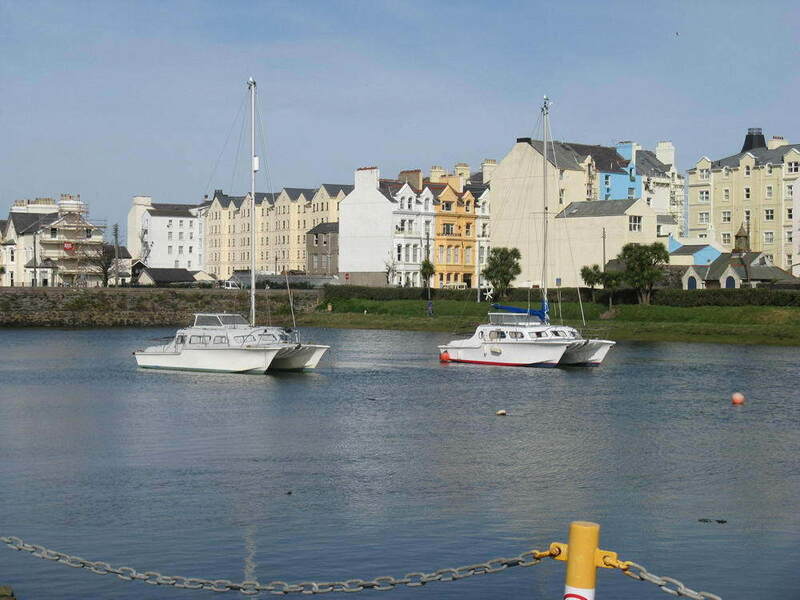 We offer congratulations to the Currans on conquering the Atlantic in a 9 meter boat as this is not only no small achievement, they're the only ones I know who have actually done it!! Well Done Jeff & Diane!! This photo was taken off Cape Finisterre on the west coast of Galicia, Spain. 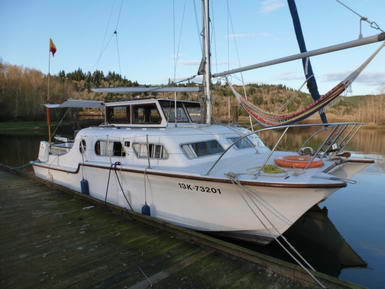 Herbert Olson of St. Helens, Oregon is selling his Hirondelle 24 to make room for his new love, a Catalac 9M which will be named S/V Fiesta. Herb plans to get her back to better then new condition over the next couple of years. He has already built a double drop leaf table, new cushion covers, new engine panel (she has twin 2gm20's) and there is a lot more to do. He also added a small drop swim platform between the davits and will replace the head with a C-Head soon. 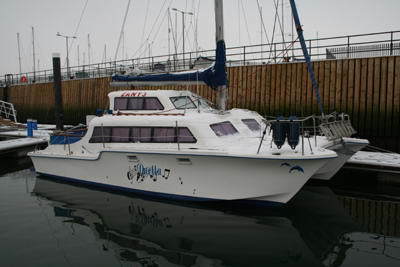 This 9M has an enclosed helm station, done by the previous owner for year round use up in the cold North West. 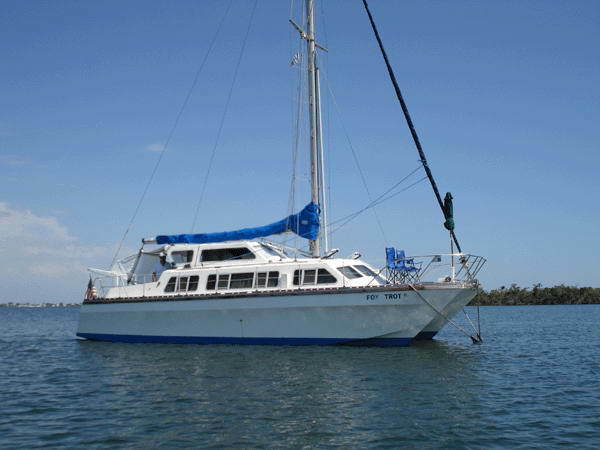 Terry Kennedy is the owner of S/V Gahitha. He resides in North Carolina but you might run into him anywhere along the east coast of the USA or the Bahamas. Terry is unique in that he flew to England in 2011 to find and purchase this fine example of a late model Catalac 900. He's pretty certain S/V Gahitha was the last boat of this model run. Ed and Gladys are the new owners of Foxy Lady. As of March 22,2012, she resides in South River, a suburb of Beaufort, NC. She is berthed at the new hog-slat dock that was built in anticipation of her arrival. 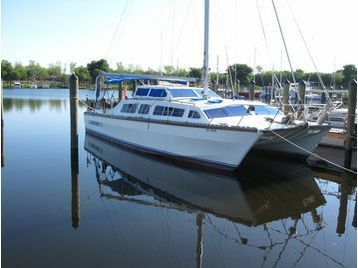 Captain Ed is busily cleaning and doing general repairs in preparation of introducing her to the sailing community in and around Oriental, NC. They plan on spending many hours entertaining and training their business associates and sharing with them the good life that is possible with the outstanding portable home based business they own. 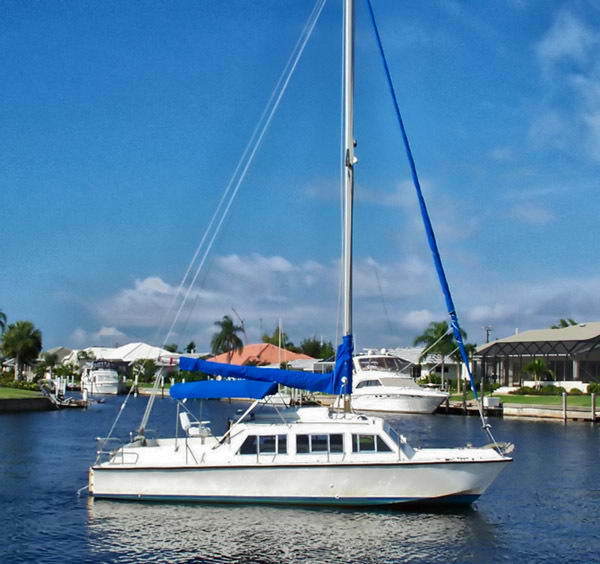 S/V Foxy Lady is a 1985 boat, hull number 188 and is in terrific shape. She also has the twin inboard 1GM10 option, which is pretty rare to find. 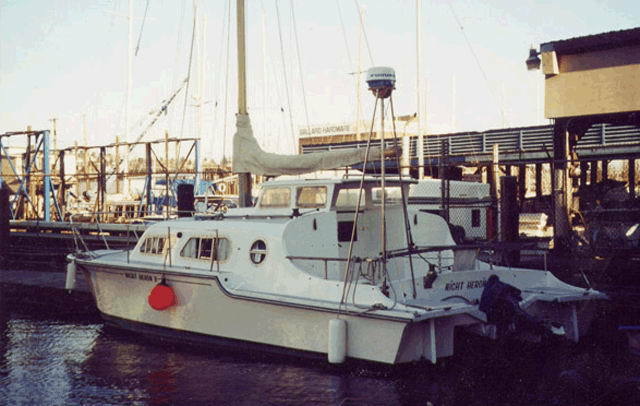 Jean Cusick and Sid Schneider have owned their Catalac 10M S/V Fox Trot since 1995. They have sailed her from Maine to Florida and the Bahamas. 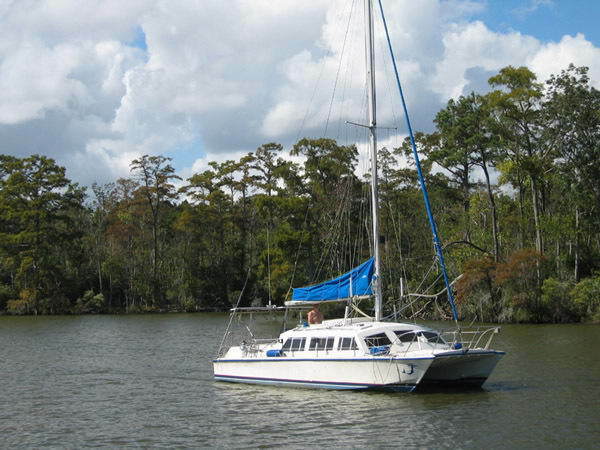 Jean says it was love at first sight when they first saw S/V Fox Trot, and she swears she's never even looked at another boat since they bought her. 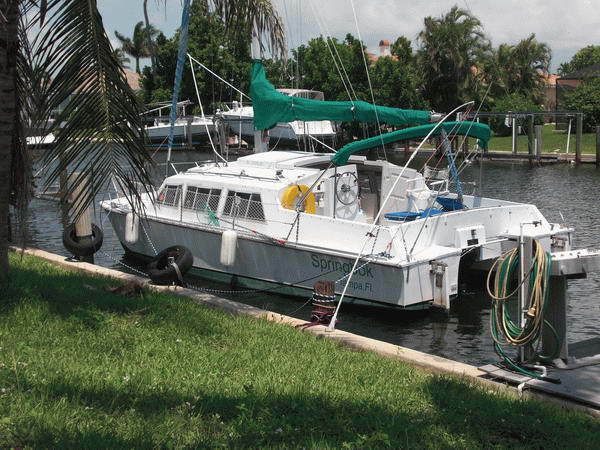 Jean and Sid finally settled in at at Burnt Store Marina, Punta Gorda, FL in 2005 and live aboard 6 months of the year. 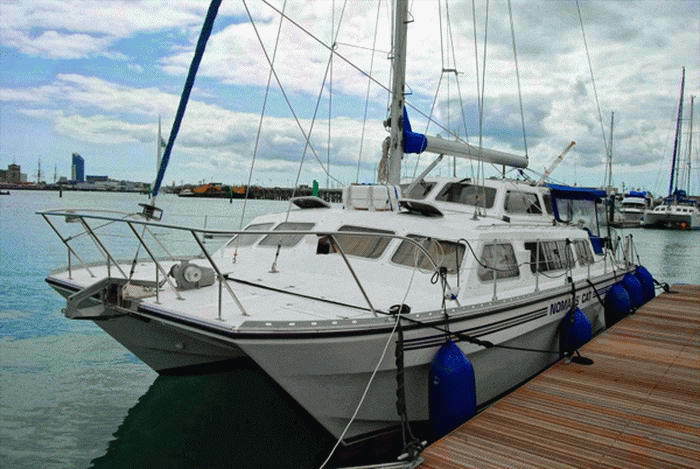 Roger Beasley is a long time Catalac 8M owner who is a member of the Gosport Cruising Club based in Portsmourth harbour, Portsmouth, England. Portsmouth is on the south coast of England and is home of the British Royal Navy. He's recently upgraded to one of the very rare Catalac 10Ms and has contributed the British 10M catalog and 10M review found on this website. 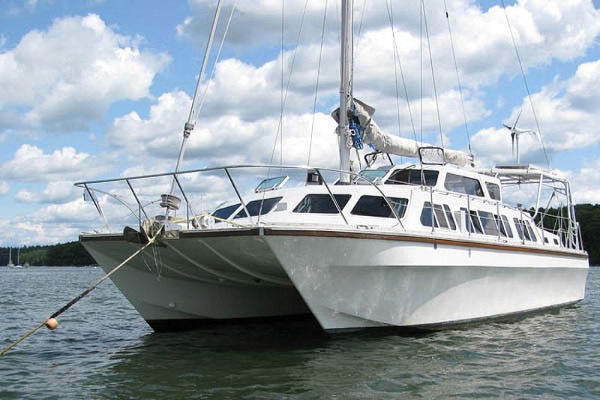 His Catalac 8M, the S/V Cygne, is now for sale. 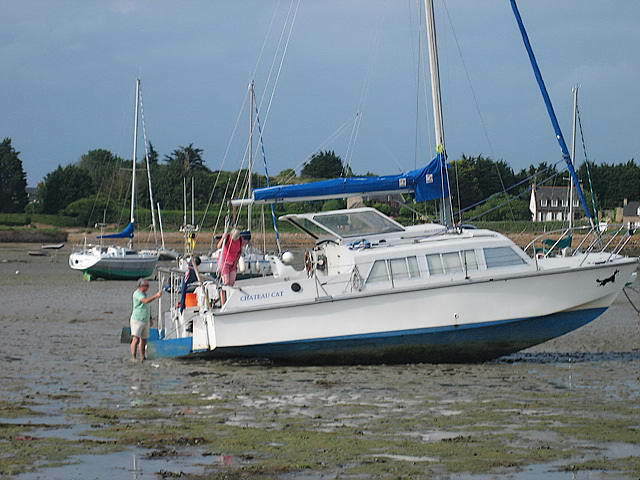 Roger Beasley has been a long time Catalac 8M owner who is a member of the Gosport Cruising Club based in Portsmourth harbour, Portsmouth, England. 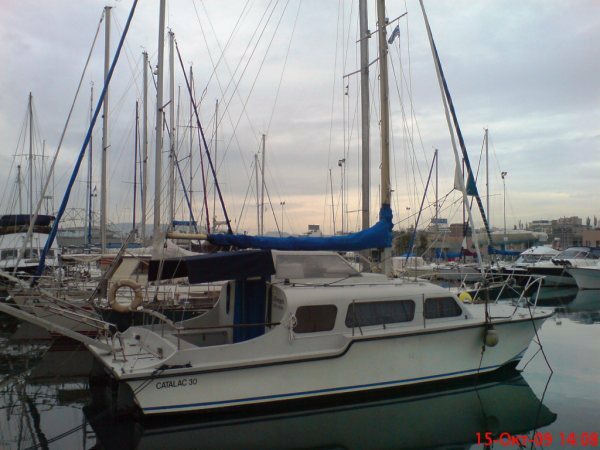 He recently upgraded to one of the very rare Catalac 10Ms sail number 42) and has contributed the British 10M catalog and 10M review found on this website. John Wilson of Padstow , Cornwall GB owns the Catalac 8M S/V Shades. He has just completed a refit in 2010 which included all new rigging, adding 2 new Vetus twin cylinder 11HP inboards, and fixed rudders with hydraulic steering. Well done John! 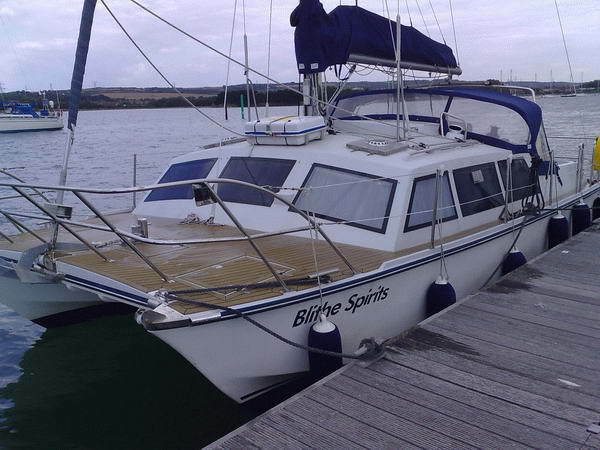 The S/V Blythe Spirits is a Catalac 8M owned by Kim Fenton of Portsmouth, England. This boat looks to have some interesting modifications. He fabricated a swim platform and pushpit, raised and replaced the stanchions and guard wires with gates. The rudders were refurbished and finished in stainless along with the mast tabernacle base. He didn’t like the way the mainsheet bisected the cockpit so fabricated a frame and moved the mainsheet traveler so it is now above head height. All controls lead to the cockpit and then there's all that teak!! 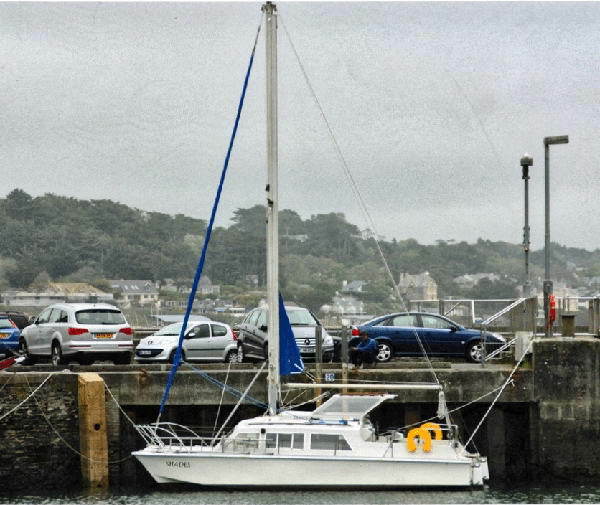 Roy Wright owns the Catalac 8M sail number 108 S/V "Chateaucat" which can be seen at Falmouth Cornwall UK. Notice the kick up rudders being used for their intended purpose. Ed and Sue Kelly's pride and joy the S/V Angel Louise. Shown here in Falmouth harbor, England after completing her Atlantic crossing. Ed and Sue left Florida the end of May 2011, and arrived in Falmouth July 21, 2011, traveling by way of (and spending time in) Bermuda and the Azores. 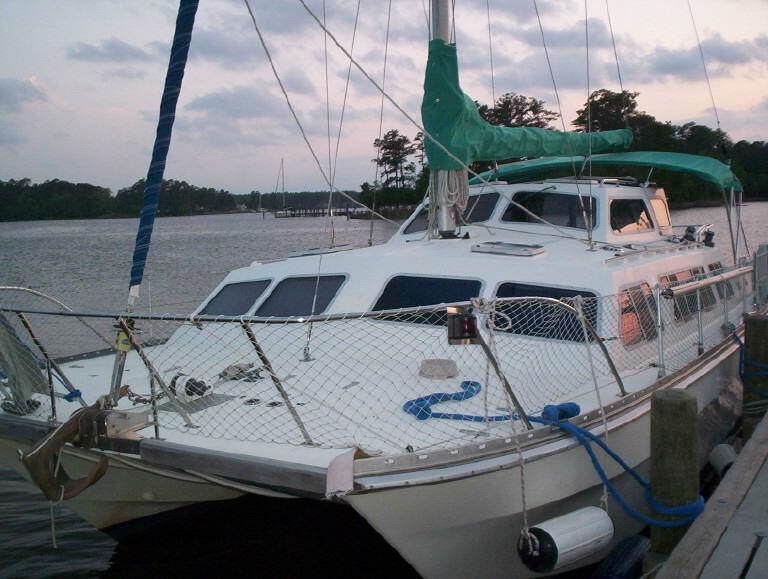 The S/V Catalpa is your humble website author's Catalac 27 (Catalac 8M). Pictured here at anchor during the Pirate Scramble event in central Florida. Owned since 2005, this boat has the rare twin diesel engine option. 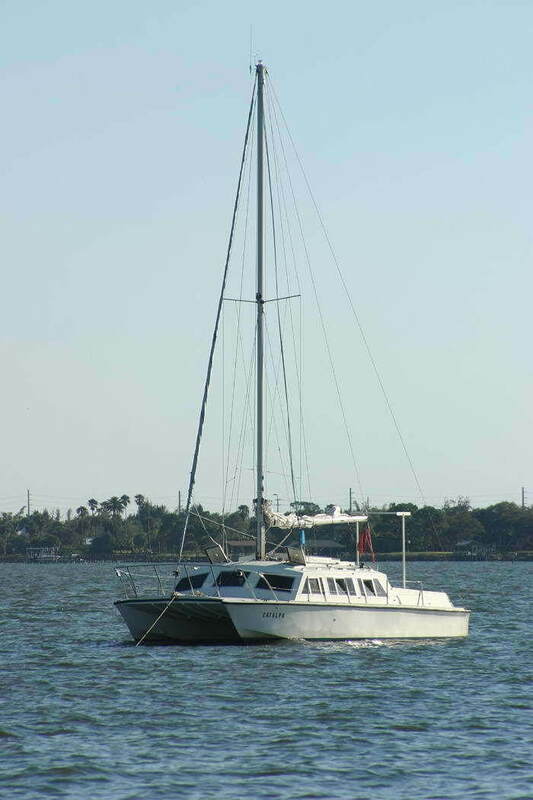 Catalpa is a very popular boat in Florida as many a sailor can attest to the fine hospitality found aboard her!! 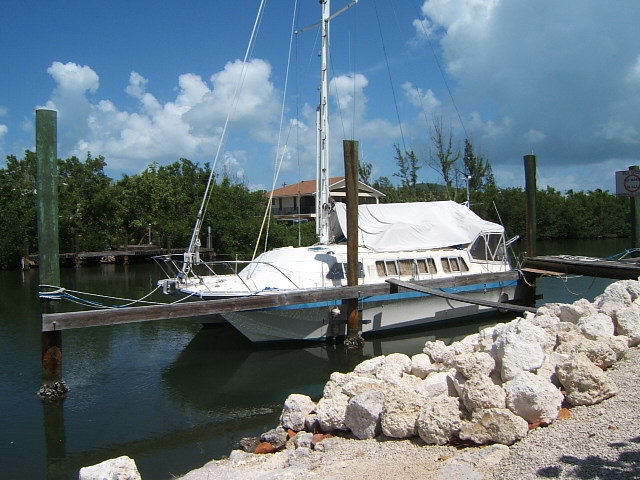 This Florida based Catalac 8M is owned by Michael Duckett, who keeps the boat at his own dock southeast of Englewood, FL. She is truly unique as she was repowered several years ago with more powerful 2 cylinder Yanmar diesels with "V" drives. The only boat I'm aware of to successfully accomplish this. She cruises at 7 knots under power!! Michael entertains the thought of selling his pride and joy from time to time...but can't find another boat which improves on his Catalac sufficiently to make the change worthwhile!! A Catalac in the middle of Asia? 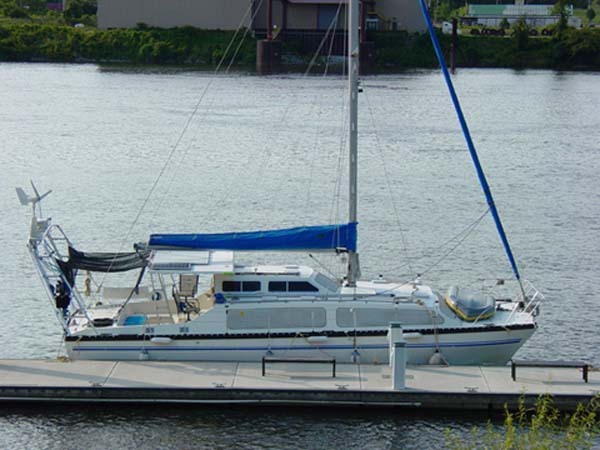 Tim Parkins is the proud owner of this Catalac 9M. He's the General Manager of a Marine Services company in Mangystau Oblast, Aktau Kazakhstan. The only Catalac I'm aware of sailing on the Caspian Sea. 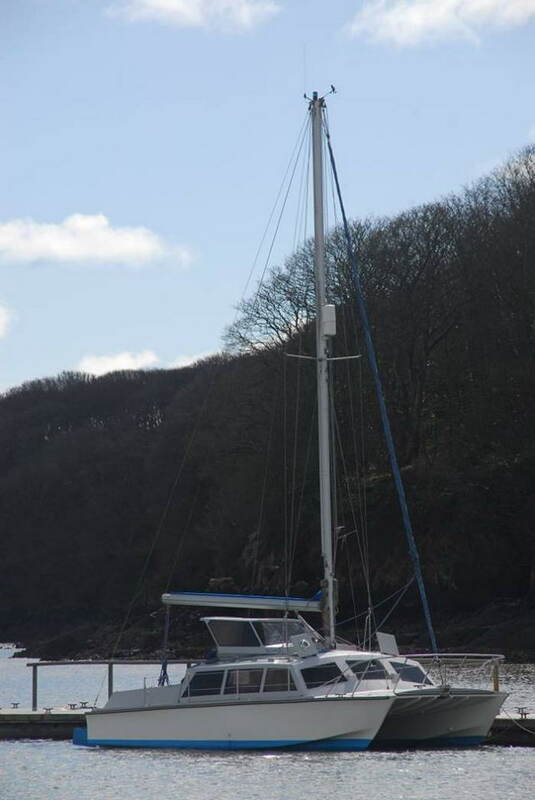 David and Margaret Jennings of Wales GB, recently acquired their Catalac 8M. They've had the rigging replaced as well as installing a new furler and are patiently awaiting that fine Welsh autumn weather to have their first sail on the S/V Arc-en-ciel de Camargue. 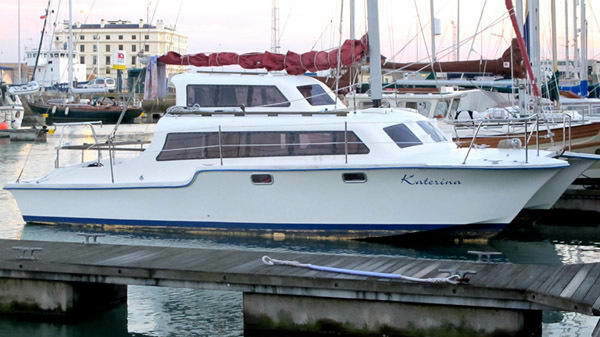 Terry Kennedy is an American who flew to England in September '10 to close on his new boat, the Catalac 900 S/V Katerina. 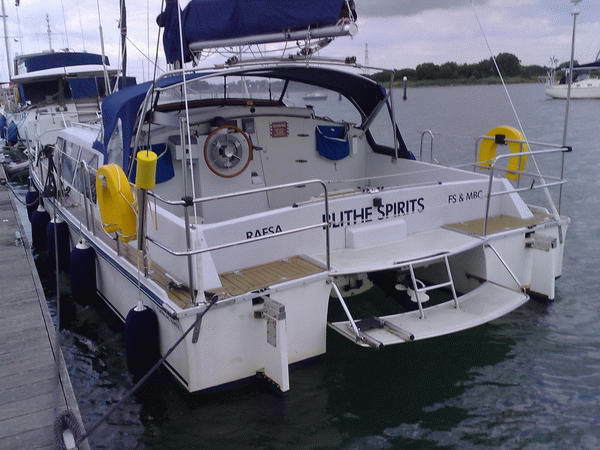 He chose a Catalac 900 because it presented the "perfect" solution to his requirement for a dive vessel. 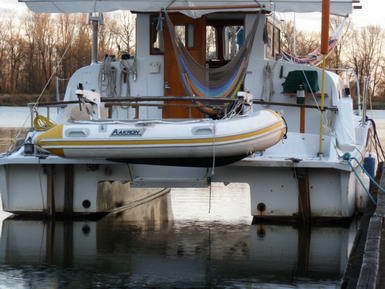 He plans on putting the boat on the hard and refitting her for his upcoming Mediterranean dive cruise. 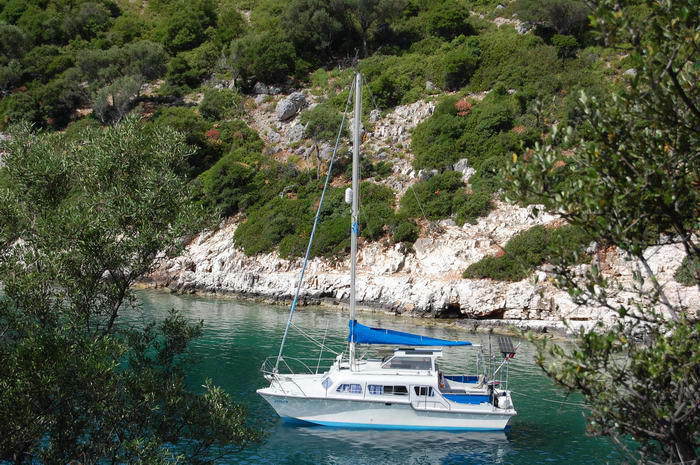 Vasilis Marketakis cruises the Greek Islands in his fine example of a Catalac 9M (Catalac 30). He recently repowered her with Kubota diesels with excellent results. I'm hoping for an article from him on how he adapted tractor engines for marine use. 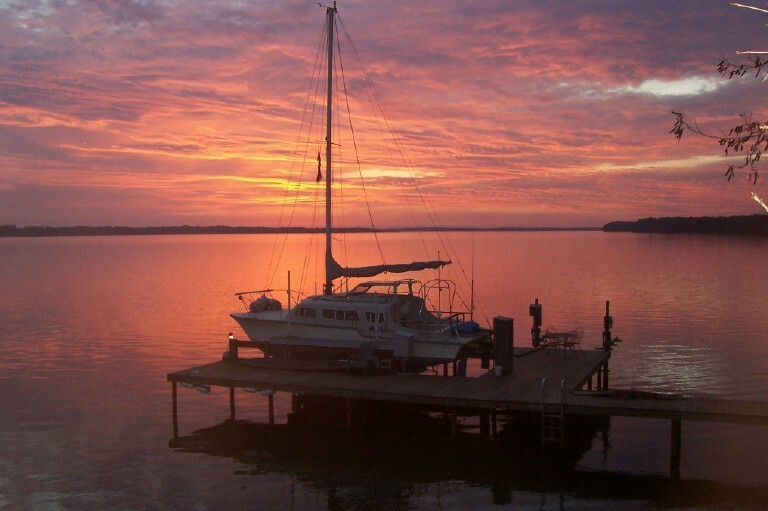 Peter Fynn is a full time live-aboard on the Caloosahachee river in Florida. He is a British ex-pat who used to live in Christchurch in the UK very near the Catalac factory and has a long time relationship with Lack family boat building and Catalacs in general. 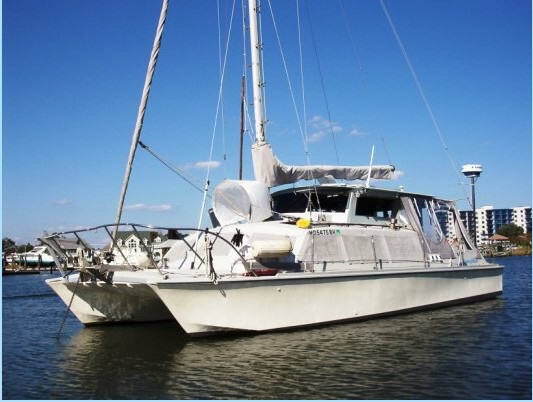 This Florida based Catalac 8M, the S/V Imoya, sail number 8-192, is owned by Emile du Toit. He just updated his furler with a new Harken MK4, and had Imoya's rudder rebuilt in stainless. With some help from the Admiral,Imoya now has new curtains. 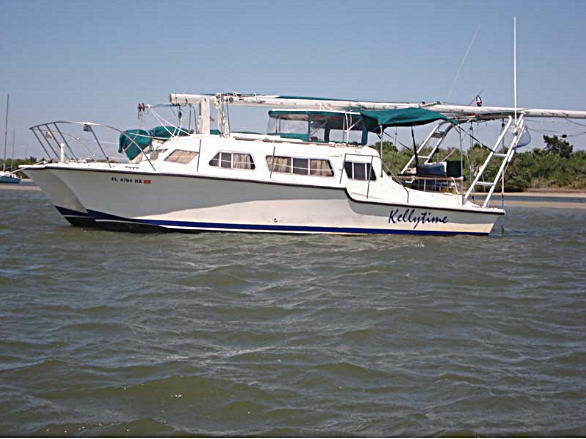 The Catalac 9M S/V Kellytime (sail number 221), is owned by Rick Whiteny of Yulee, FL. Please note one of the benefits of the 8M and 9M boats, which is the ability to lower the tabernacle based mast. 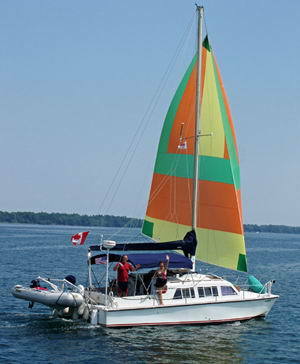 The Catalac 900 S/V Duetta, sail number 911, owned by Kevin Broadbent & co-owner, Jim Horan of Isle of Man. Adrian and Jacky of Great Britain own the 8M S/V Achillea. This is their 2nd Catalac as they owned a 9M many years ago. Apparently a Cat comes in handy when dealing with those English tides!! 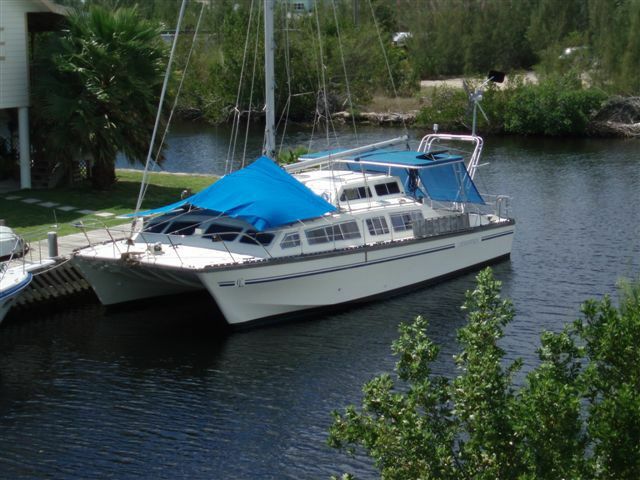 This Miami, FL based 1984 Catalac 12 Meter was just sold by Jack McCammond who owned the boat since 1991. 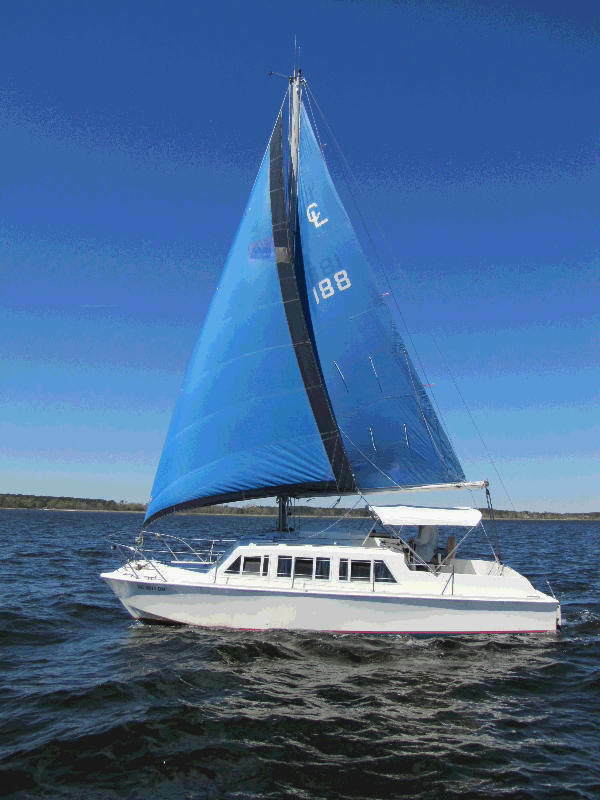 Jack and Lynn Robinson of Fort Collins, Co have just recently purchased Felix and plan on spending their time heading down the ICW to Florida and the Bahamas. 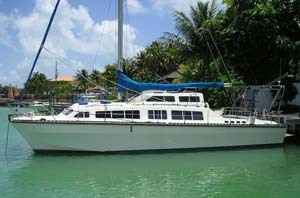 Rochelle Mefferd is the new owner of S/V Caymanifique. 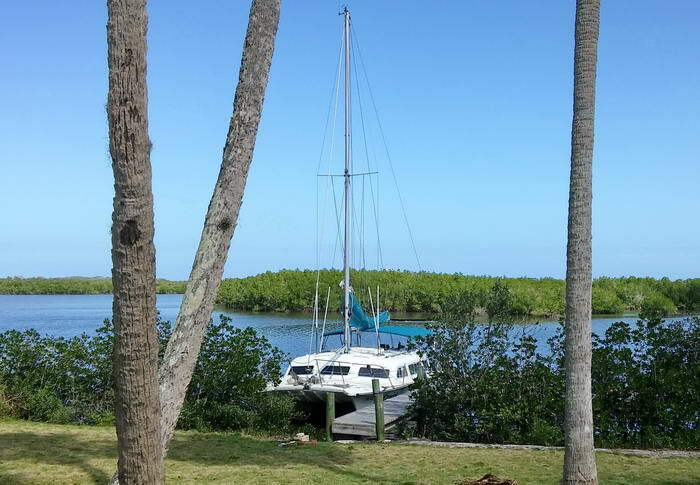 She bought this beautiful Catalac 12M from friends of mine in the Caymen Islands and sailed her to her new home in Texas where the boat is receiving some TLC. Steve and Ann Bolin own hull #6. She's in Corpus Christi TX. They've been long time monohull owners who look forward to cruising in their new Cat. Steve Ramsey, who lives in my part of the world. He's a great guy and indispensible as he has the only mast lowering pole for a Catalac 8M in the area!! Ed and Sue Kelly crossed the Atlantic from Georgia to London England in May of 2011. Currently crusing the British Isles.